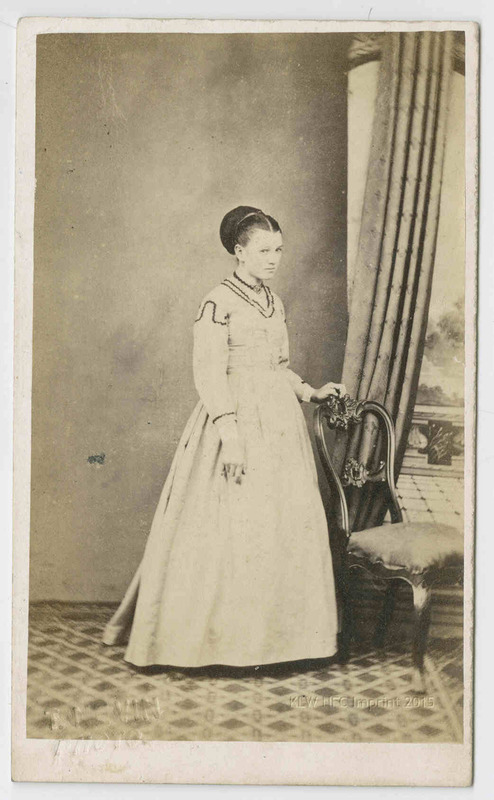 Photographer: Thos Nevin, New Town (stamped verso). 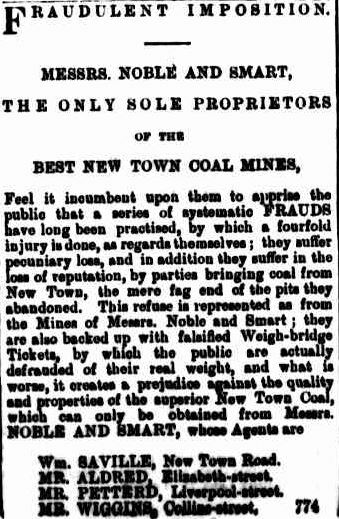 From the notice below, which appeared in the Mercury, February 1871, it would seem that inferior coal or pit refuse from abandoned pits was being sold to the public as the property of the New Town coal mines owned by Messrs Noble and Smart. The fraud included falsified weigh-bridge tickets. 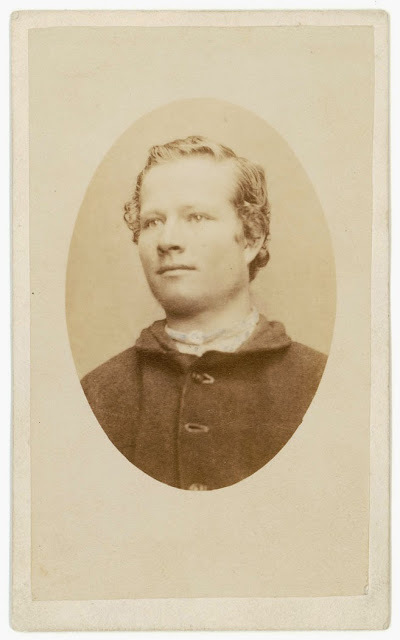 The former Commandant at Port Arthur, James Boyd, incumbent to the position prior to the appointment of A.H. Boyd (who was NOT a photographer), had left Tasmania by the 29th December 1873 on the barque Ethel, bound for England (per The Mercury, 29 Dec 1873). 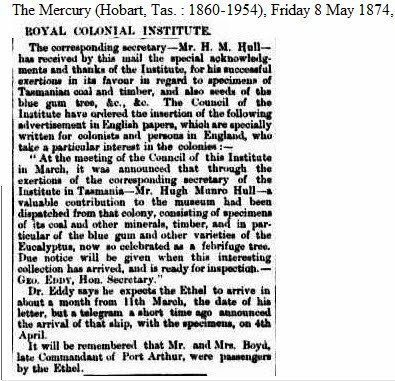 On board were specimens of Tasmanian coal, minerals, blue gum and other specimens of Eucalyptus of interest to the British Royal Colonial Institute. 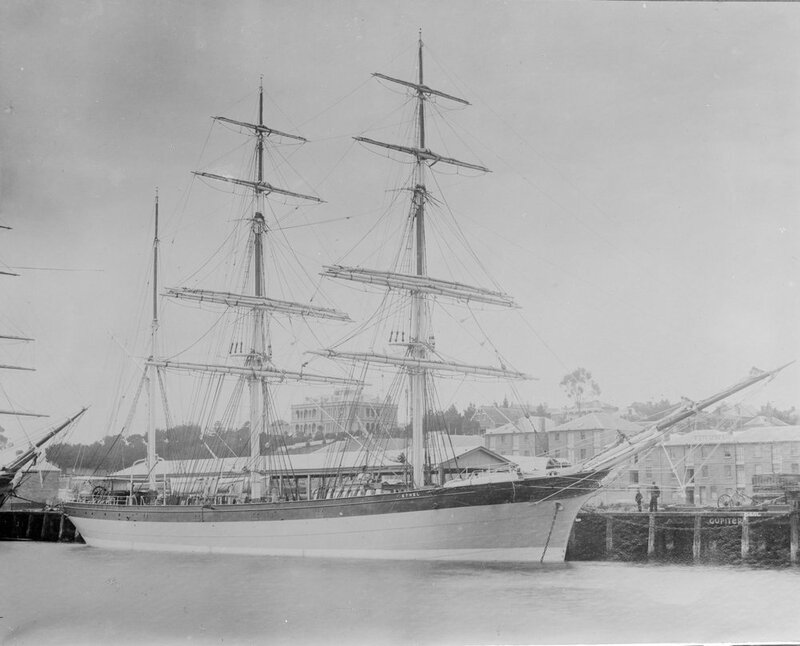 The Ethel was due to arrive in England on April 4th, 1874. 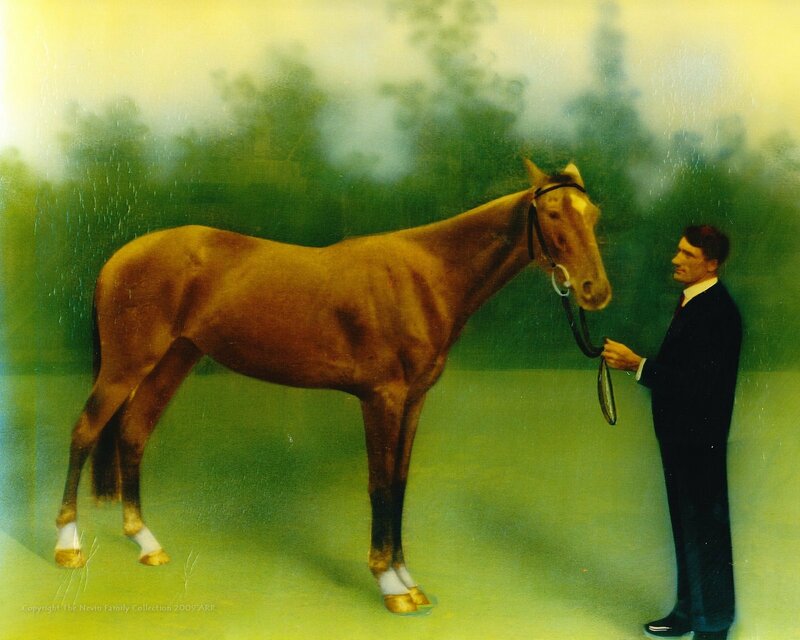 Alan Green Collection Shipping Photographs in Picture Collection. 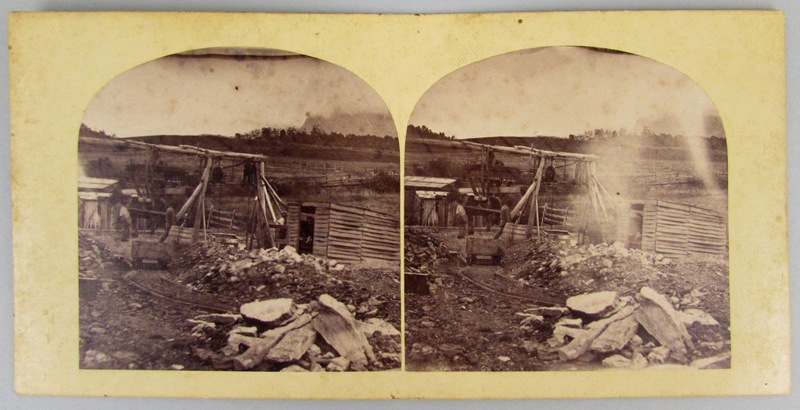 The year 1874 was a busy one for Thomas Nevin. 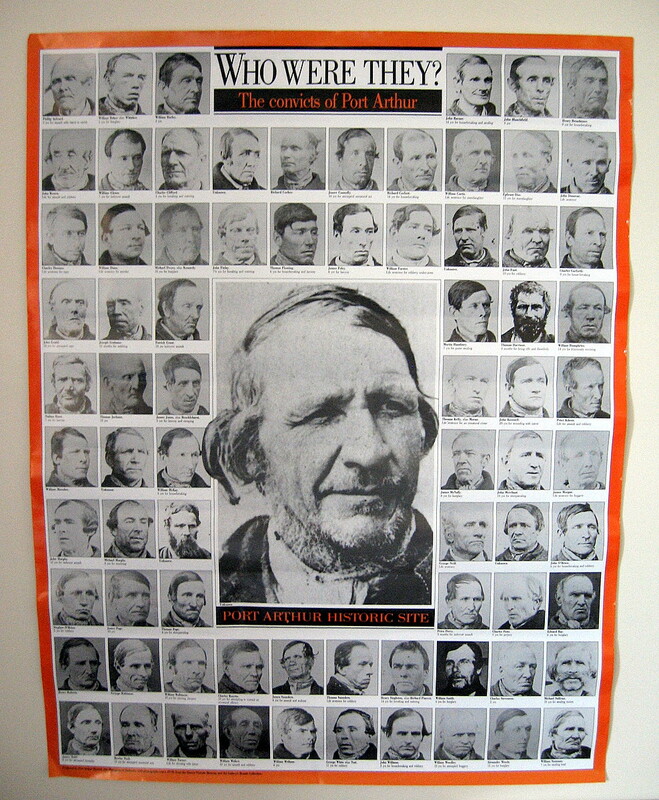 He was under contract to the Municipal Police Office and Prisons Department to provide mugshots of prisoners received and discharged at the Hobart Gaol for the MPO registers, photo books and police gazettes at the Town Hall, while continuing to operate full-time as a commercial photographer from his studio at 140 Elizabeth-Street in Hobart. 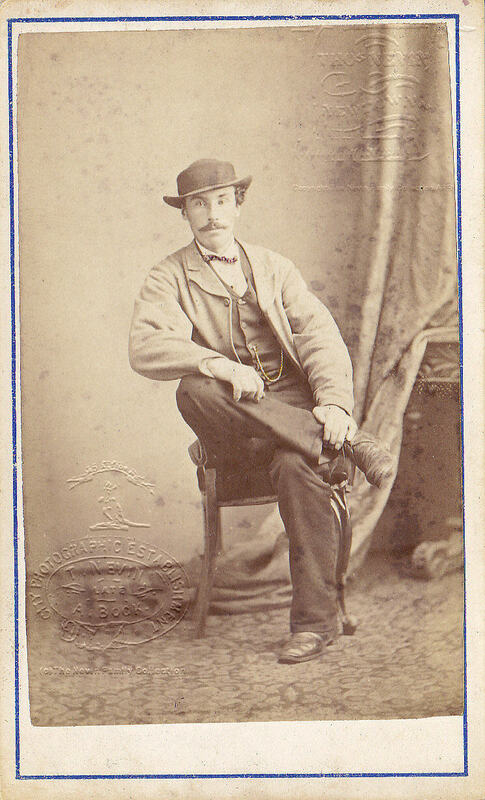 His second child, Thomas James “Sonny” Nevin, was born on 16th April 1874. His membership of the Loyal United Brothers’ Lodge annual Anniversary Ball committee entailed the provision of photographic services on the night of the ball, and extended to placing advertisements in The Mercury to procure professional services for Lodge members and their family, including medical services. 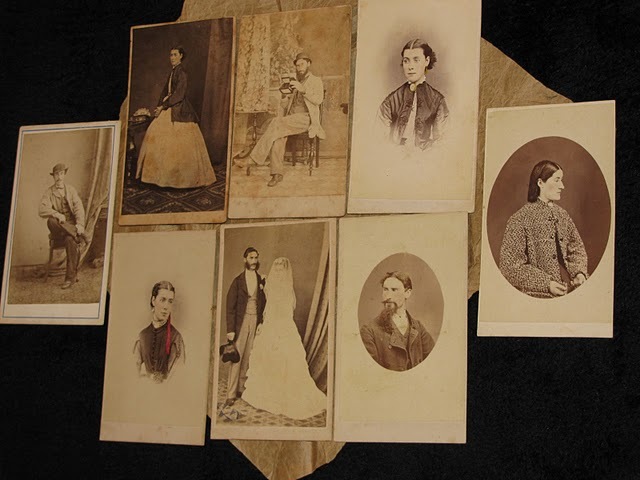 And he worked closely with the printers at the Hobart newspaper offices of The Mercury, producing miniature photographs of the front pages for sale as Christmas visiting cards (measuring 3 inches x 2 inches). 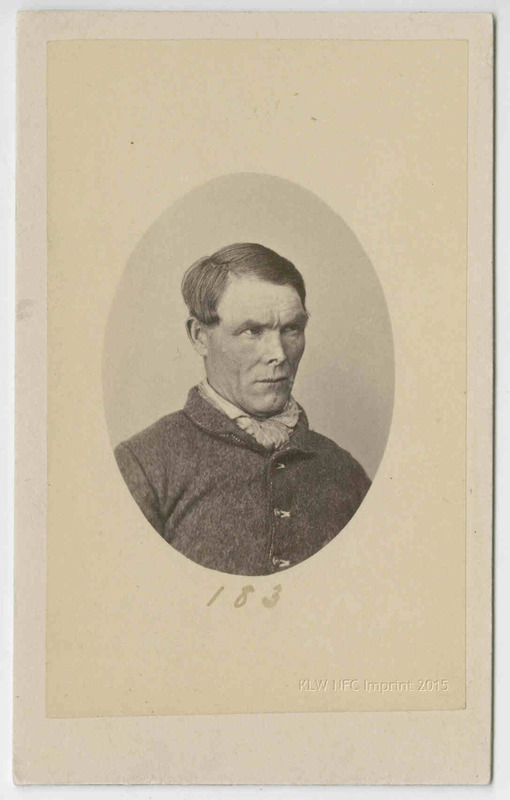 Thomas Nevin was a city agent for coal deliveries from Messrs Sims and Stops coal mine, located at Kangaroo Valley New Town, close to the family farm where John Nevin snr had built their cottage and orchards on land in trust to the Wesleyan church above the Lady Franklin Museum. 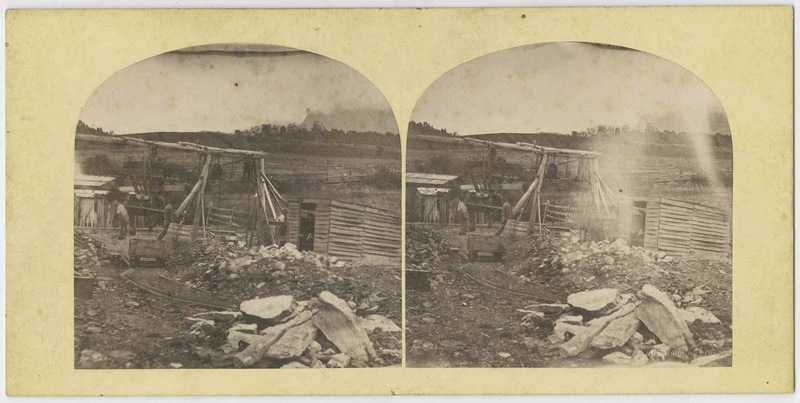 The Nevin family were closely associated (related even) to the Hurst family of surveyors resident of New Town and the Saltwater coal mines (on the Tasman peninsula). 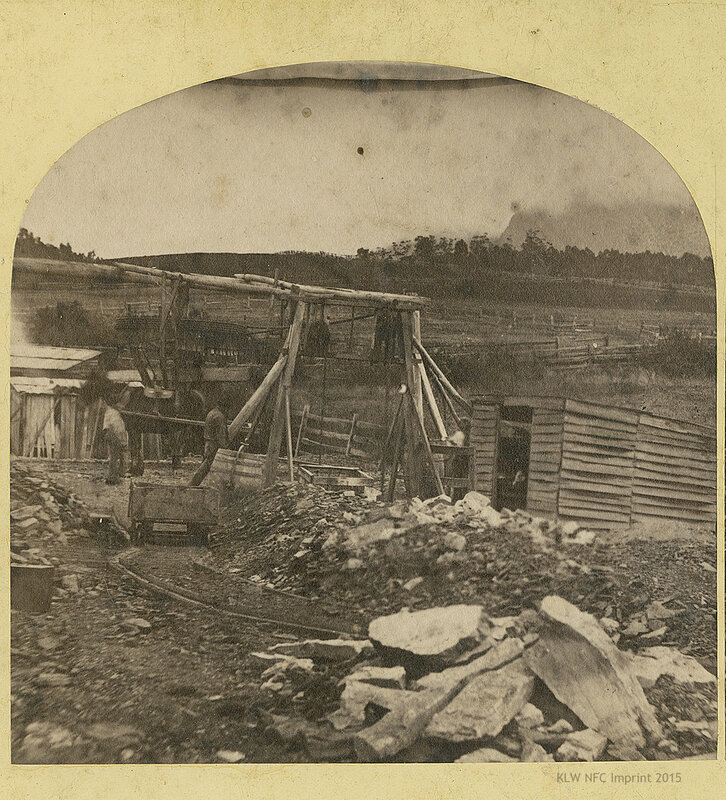 As stakeholders in the coal business, and probably shareholders in several other profitable businesses, Thomas Nevin, unlike several other members of his photographers’ cohort in Tasmania and Victoria, escaped bankruptcy when they didn’t (e.g. 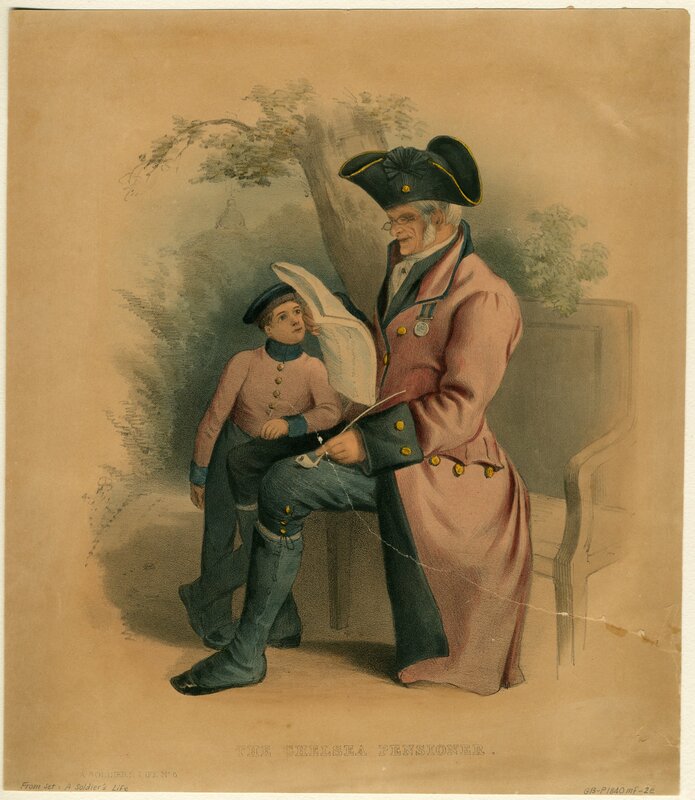 Alfred Bock, George Cherry, Stephen Spurling, Harold Riise, and Charles Nettleton in Victoria etc), and managed to keep his wife and children (six survived to adulthood) in comfortable circumstances. 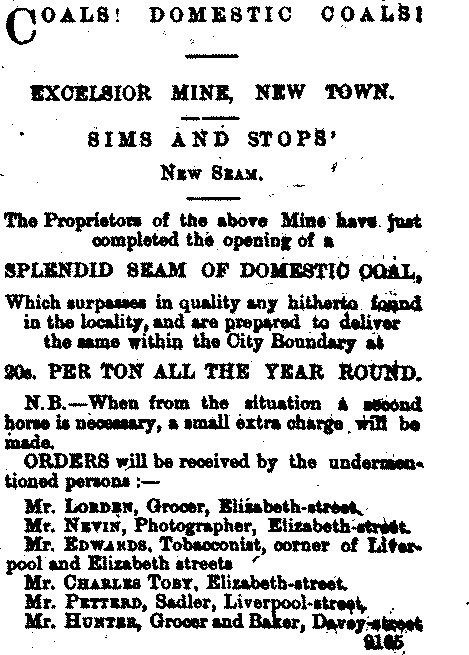 Mr Nevin, photographer, Elizabeth-street, appears in this advertisement as an agent able to take orders for the delivery of coal from the Excelsior Coal Mine which was located on Mr Ebenezer Sims property at Kangaroo Bottom (Kangaroo Valley New Town), in close proximity to the home of Nevin’s parents. This coal was for domestic use but may have been included in the coal specimens which were exported to the Royal Colonial Institute, accompanied by James Boyd on board the Ethel in 1874. … N.B. – When from the situation a second horse is necessary, a small extra charge will be made. 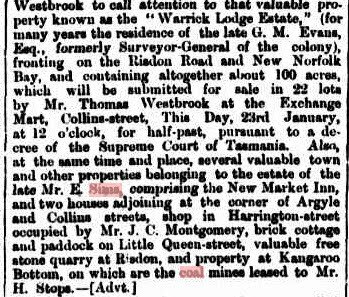 Auction advertisement for the sale of the late Mr E. Sim’s coal mines leased to Mr H. Stops at Kangaroo Bottom. 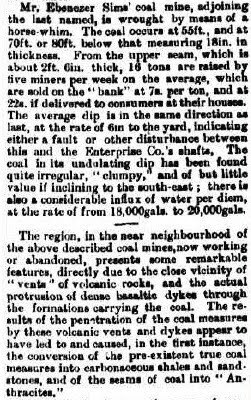 A lengthy geological report was published in The Mercury, 23 December 1883, on the coal mines and seams around Mt Wellington, including a description of the methods of mining at Mr Ebenezer Sim’s Excelsior Coal Mine and an account of the formation of anthracite, shale and sandstone in the Kangaroo Valley area. 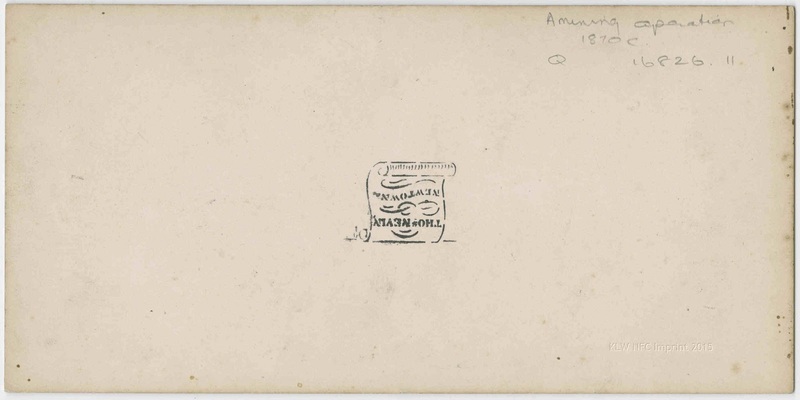 TMAG Collection Ref: Q16826.11. Taken at the TMAG November 10, 2014.